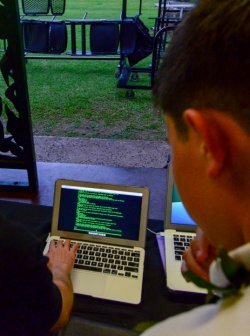 The Kaikaina program puts Purple Mai’a coding and computer science kumu at schools and youth organizations around the islands. Classes are either after school or elective, and they are free to students ( funded by private grants and contracts). Kumu are Native Hawaiian or local people, many are parents, and all have CS knowledge and are passionate about sharing this knowledge to positively affect students’ lives. We run an adaptive, mobile network of teachers with their own class sets of computers, making use of remote/online teaching when necessary, that reaches students at 8-13 locations. 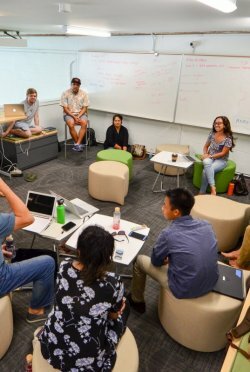 To support our ambition of teaching CS in a way that is based in ancestral knowledge and cultural practice, we depend on collaboration, whether it’s simply a language immersion school allowing us to teach their students, a teacher at a school that welcomes our instruction as a supplement to their own curriculum on another topic, or nonprofit ‘āina and community orgs that host our field trips and events. The R&D arm of Purple Mai’a, Purple Labs houses our work in curriculum development (before curriculum hits the classroom); game and app development; as well as research and development of new educational models. In 2019-2020 the Purple Labs project will continue into year two of the development of an Innovation Kula. For more information and/or to inquire about your child attending our innovation kula, email us at kula@purplemaia.org. The Purple Prize is an innovation competition that brings together people across sectors to build technology solutions that create value for land and people. It is consciously designed as an opportunity to co-learn with the community and socialize a different framework for thinking about technology, innovation, and their role in strengthening Kanaka Maoli and creating a better future for all who call Hawai’i home. The competition is broken into two phases that allow for connections and accelerated growth. Teams and individuals who compete in the Purple Prize are forces for sustainability and systems-change and are the foundation of a local technology sector rooted in Kanaka Maoli values. We believe that the exponential power of technology can be a vessel for scalable, positive impacts when innovation is grounded in Native Hawaiian culture; cross-pollinates with the priorities and competencies of the related fields of social entrepreneurship and sustainability; and builds impactful, scalable technology companies that transform the status quo and plant the seeds of an Indigenous innovation ecosystem here in Hawai’i. For more information, visit www.purpleprize.com.